Before arriving at the University, Charlie Young never dreamed he would go into baseball. He became interested in baseball analytics after the Chicago Cubs won the World Series his freshman year. 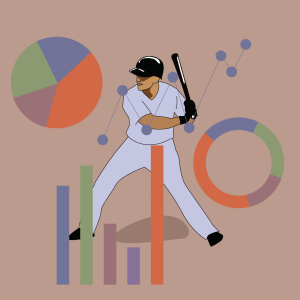 Illinois Baseball Analytics is a sort of subset of the baseball team that analyzes data for the University’s team. Young, junior in LAS, started the group around two years ago. Already a passionate baseball fan, Young learned the Cubs’ general manager at the time, Theo Epstein, worked with the analytical manager of the Red Sox when they won, prompting Young to use his own computer science skills to analyze baseball as a hobby. He got himself a database online with statistics dating back to the 1890s. Young taught himself database management, web development and a little bit of statistics. “I found that A, I really enjoyed it, (and) B, I was pretty good at teaching myself,” he said. In time, Young consumed all the material he could find relating to the topic. He read books he bought for Christmas on data analytics. In one of the books he read, he came across a pioneering analyst, Alan Nathan, a professor at the University. Young approached him to share and discuss all he had learned. Coincidentally, at the same time, the baseball team had approached Nathan asking for advice purchasing Flightscope, a device used to calculate various measures of players’ skills. The team had also asked Nathan if he knew of any students who could run the Flightscope for them. Nathan asked Young if he wanted to run the program, to which he agreed.